Modular airborne computing platforms for connected aircrafts, passenger infotainment, and augmented reality applications have been announced by congatec at Aeromart Toulouse (hall 6, stand B24-C25). Designed for converged edge servers in aircrafts, the COM Express Type 7 Server-on-Modules are suitable for content delivery applications to seatback screens and passengers’ mobile devices, as well as for predictive maintenance and other Big Data applications, video surveillance, and cloud-based flight data recordings. The platforms are also suitable for augmented reality (AR) applications in aviation to optimise the navigational capabilities in low visibility areas, and are applicable in AI-based virtual assistants for improving pilot productivity and efficiency as well as enhancing passengers’ flight experience. Server-on-Modules also help to solve obsolescence issues as the standardised modules can easily be upgraded in the design. Additionally, the densely packed robust modules help to optimise the SWaP-C demands of modern airborne applications due to the compact, lightweight, highly efficient and cost-optimised footprint. The edge server platforms for aircrafts are based on the COM Express Type 7 Server-on-Module standard specified by the PICMG and are equipped with Intel Atom, Pentium and Xeon processors. They meet requirements for operating in harsh airborne environments, including support of the extended temperature ranges as well as high shock and vibration resistance. Providing optional coating for humidity resistance, the modules are qualified to meet extended environmental standards. 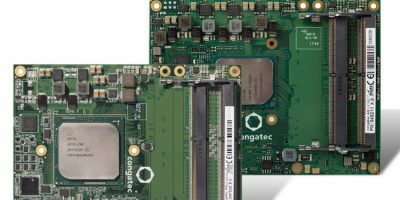 Engineers using these COM Express Type 7 Server-on-Modules benefit from an application-ready processing core that simplifies the design-in of the latest technologies, but also from the congatec premium support package for OEM designs.